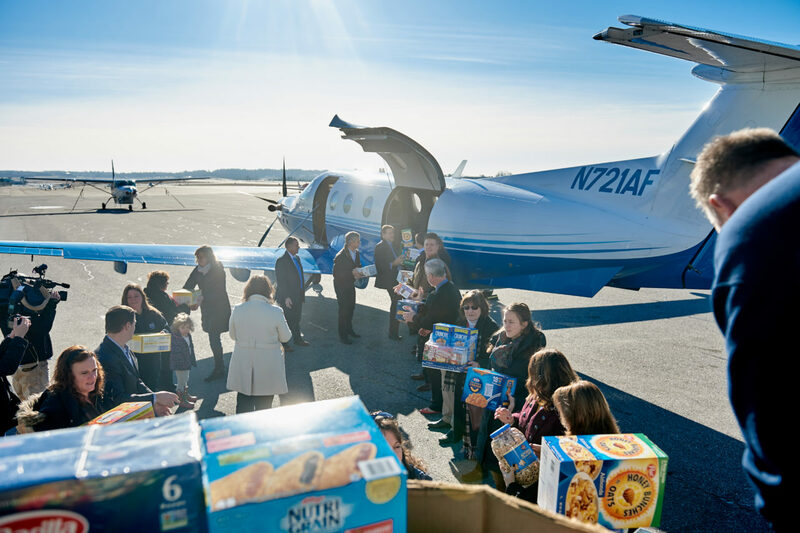 PlaneSense Inc. one of the nation’s largest fractional aircraft ownership companies, collected 3,192 pounds of food donations for the NH Food Bank through the generosity of many within the PlaneSense family as part of the company’s Annual Holiday Food Drive in December. 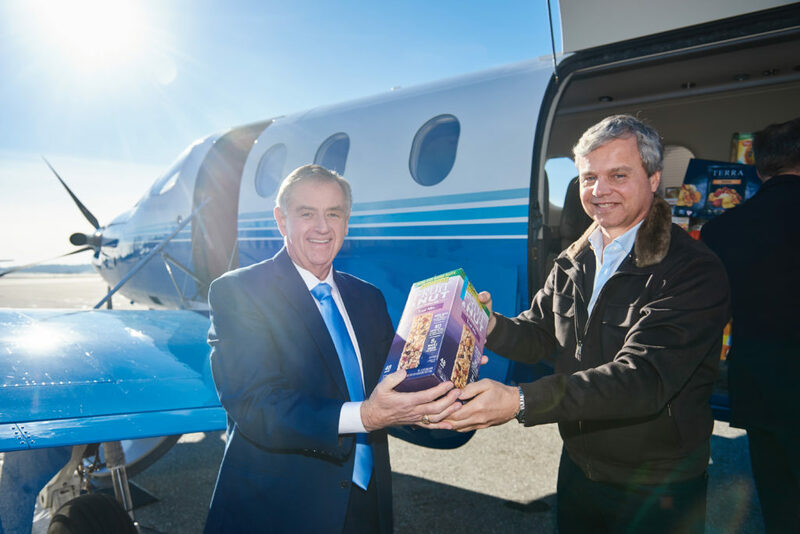 The donations were loaded onto a Pilatus PC-12 aircraft and flown to Manchester-Boston Regional Airport by PlaneSense President and CEO, George Antoniadis, where it was met by New Hampshire Governor Chris Sununu, Congressman-elect Chris Pappas, NH Food Bank Executive Director, Eileen Liponis, and many others. 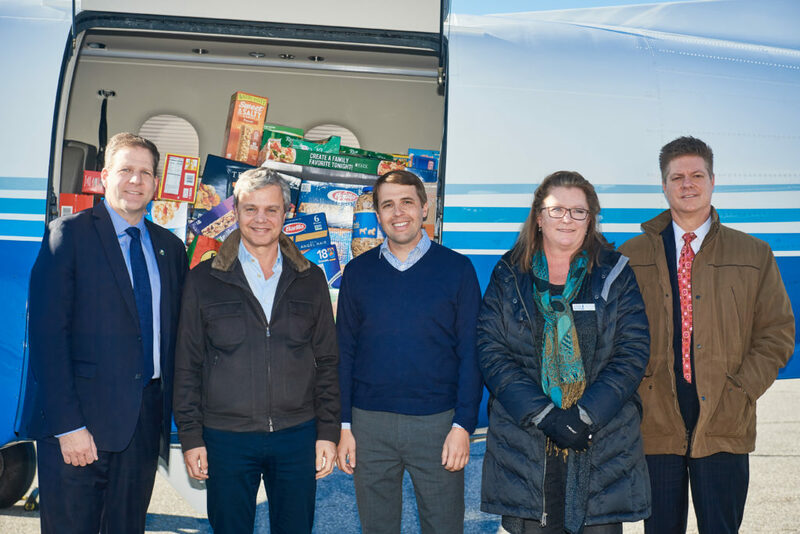 Pictured left to right: NH Governor Chris Sununu; PlaneSense, Inc. President and CEO, George Antoniadis; Congressman Chris Pappas; NH Food Bank Executive Director, Eileen Liponis; and President, NH Grocer’s Association / Chair, NH Food Bank Advisory Committee, John Dumais. Since beginning its annual holiday food drive in 2014, PlaneSense has collected more than 11,500 pounds of food, the equivalent of nearly 9,600 meals for families across New Hampshire. One out of every nine people in New Hampshire lack reliable access to healthy and affordable food. The New Hampshire Food Bank provides hunger relief to the thousands of people suffering from food insecurity every year through 400 community partnerships, food drives, and education programs. Donations poured in this year from PlaneSense staff as well as business partners, including: Schrager Hampson Aviation Insurance, Baker Newman Noyes, Customers Bank, People’s Capital, USAIG, Port City Air, and Raka Creative. To learn more about the NH Food Bank, its work and more ways to get involved, visit nhfoodbank.org. Tom Blonski, President & CEO, Catholic Charities NH, and George Antoniadis, President and CEO, PlaneSense, Inc., help unload food donations.